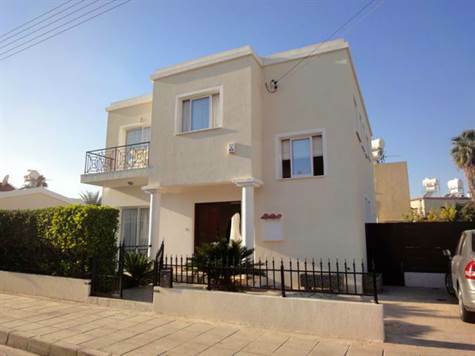 Chloraka Village, Paphos - This beautifully presented detached villa is located in a quiet residential street in the popular area of Chloraka, within walking distance to the beach, local shops & restaurants, and the local bus route running between Paphos and Coral Bay. The property features spacious split-level living accommodation including a comfortable lounge, formal dining area and fully fitted kitchen with breakfast bar. The kitchen is well equipped with built-in oven, gas hob, extractor fan, fridge/freezer and dishwasher. A corner utility cupboard houses the washing machine and provides useful additional storage. A guest cloakroom and storage cupboard is situated at the base of the staircase leading up to the first floor. Upstairs are three good size double bedrooms, all with fitted wardrobes and balcony access via patio doors. The master bedroom has an en-suite shower room with double size shower and vanity unit, and there is a family size bathroom directly off the landing. The property has two separate verandas on the ground floor, providing ideal space for relaxing/outdoor dining. Steps lead down from the rear veranda to a bbq area and the swimming pool with corner pergola. A combination of hedges and fencing provides good privacy to the plot which includes a variety of fruit trees including lemon and orange. The property is in immaculate condition with good quality finishes and is designed with low maintenance in mind. It is ideal as a holiday home or permanent residence and has full title deeds.